It's done! Yesterday I finished up the binding on my Petal Pusher quilt and took it over to the Morton Arboretum for some Fall photos. I found this really magical nook with TONS of leaves. I need to bring my kids over to the same spot and let them go crazy. 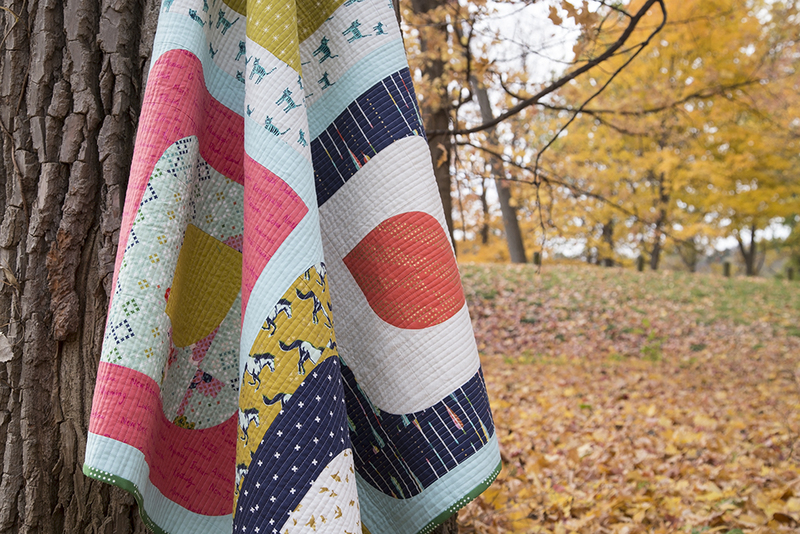 This quilt is a combination of Angela Pingel's awesome Petal Pusher pattern from her book A Quilter’s Mixology, lots of Cotton + Steel fabrics, and one of my favorite gold bird designs from Violet Craft. 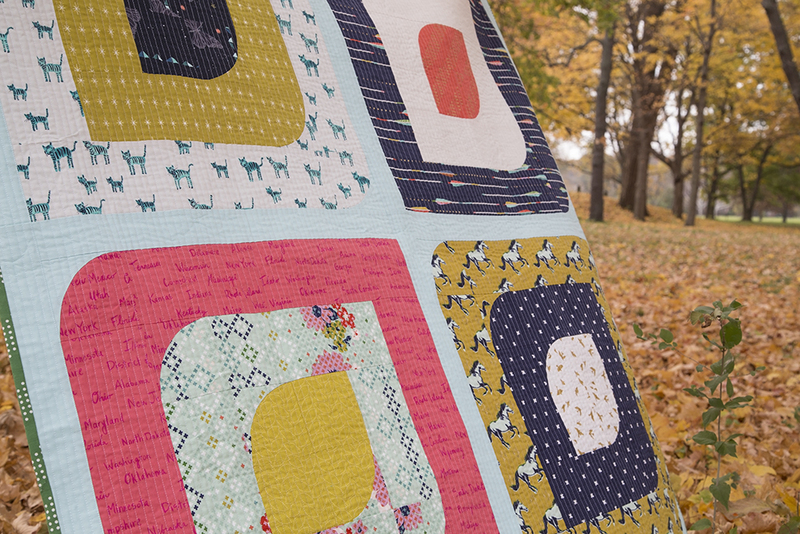 The blocks in the Petal Pusher quilt are deceptively large - 24" squares! This is a great pattern if you are looking for a lot of "WOW!" for your sewing time. Although there are curves (which scare me), there's not a ton. 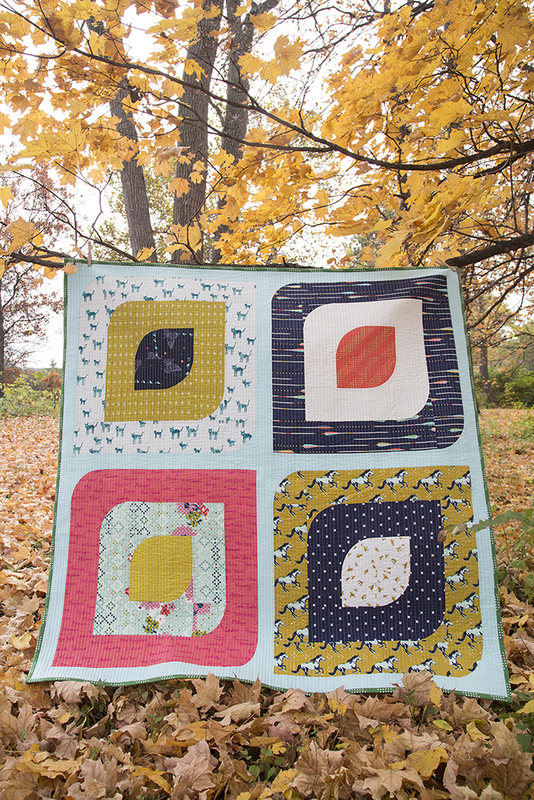 And with the giant blocks, you only need to make 4 to make a nice sized quilt, 54" square. I quilted with straight lines, all around 1/4" apart from each other. I don't mark my quilts typically, just use the edge of my foot, or some location on my foot, for a guide. When you look at the solid fabric backing, you can really see the texture that the straight lines give the quilt. The binding is a fun dot print from Cotton + Steel. I wasn't really expecting to use this shade of green, but I just love how it finishes off the quilt! My daughter really wants this quilt, but she has sooooo many already. I think I'm going to donate this one and hopefully brighten someone special's day. I definitely recommend this pattern and Angela's book, A Quilter’s Mixology, whether you enjoy sewing curves or are intimidated (like me!) but want to give it a shot. I promise, the directions and tips are fantastics and it's much easier than it looks.